Let them dance with the waves! After a brief stroll across the beach early this morning, I came across this unfortunate Blue jellyfish. Its drifting days along the ocean currents, finally came to an end on my favourite beach. I remembered my father telling me that washed up jelly fish are usually dead but they could still give you a nasty sting. The warm weather has seen an increase in the population of jellyfish around the Welsh coast. Research has discovered that since the collapse of the herring fishery in the Irish Sea, jellyfish have increased in population. 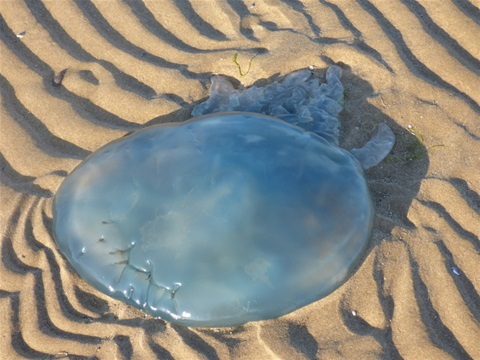 Normally on the Welsh coast, we will see Lions mane, Moon jellyfish, Compass jellyfish and the Blue jellyfish. If you are lucky enough to see one gliding through the water, you will notice that in order to propel itself forward, the jellyfish will squirt water from its mouth. These fascinating creatures with pulsating bodies, hunt for shrimps, crabs and tiny plants. In turn, they are hunted by turtles that appear to relish the Jellyfish. And the Chinese also hunt them for medicine. Jellyfish don’t purposefully attack humans. Most stings happen when they are touched accidently and sometimes, this can be fatal. Perhaps they are better left alone, to live their lives dancing with the waves.